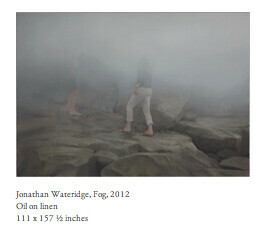 L&M Arts to Feature Jonathan Wateridge - Yo! Venice! L&M Arts will host an opening reception for “Inter + Vista”, an exhibition of new work by artist Jonathan Wateridge, on Thursday, January 17th, from 6-8pm. This will be the first exhibition in Los Angeles for the London based Wateridge, and feature his formal, densely structured paintings in one gallery building and his more organic, lyrical canvases in the other. Continuing his practice of building life-sized sets as maquettes for his work, for this exhibition Wateridge explores the microcosmic details of these scenes. His new works focus on the slight, even banal, gestures that, when removed from a narrative context, provide visual insight into our collective aesthetic. In Boy on Wall (2012), the curvilinear flesh of the boy peering over a wall clashes with the austere, brutalist architecture of the man-made structure he climbs. Together, they form a cohesive palette of oft-conflicting tendencies in modern painting- realism and formalism- challenging their categorical separation and arguing that a bridge between the two can be found within the medium. My hope is that by paring back context and gesture and by heightening the staged simplicity of the environments, narrative and meaning are actually opened up. These paintings cross reference each other both formally and narratively in richer ways than some of the more notionally connected images that I’ve previously made. Jonathan Wateridge was born in Zambia and attended the Glasgow School of Art. He work has been shown extensively, including exhibitions at The Saatchi Gallery, Francois Pinault Foundation’s Palazzo Grassi in Venice, and All Visual Arts in London. He lives and works in London.